While pouring over maps trying to decide our destination for the next couple of days, we spot an attraction called Wisconsin Concrete Park. “Nah”, I said to John, “it’s probably just a big skateboard park.” Wrong-o! 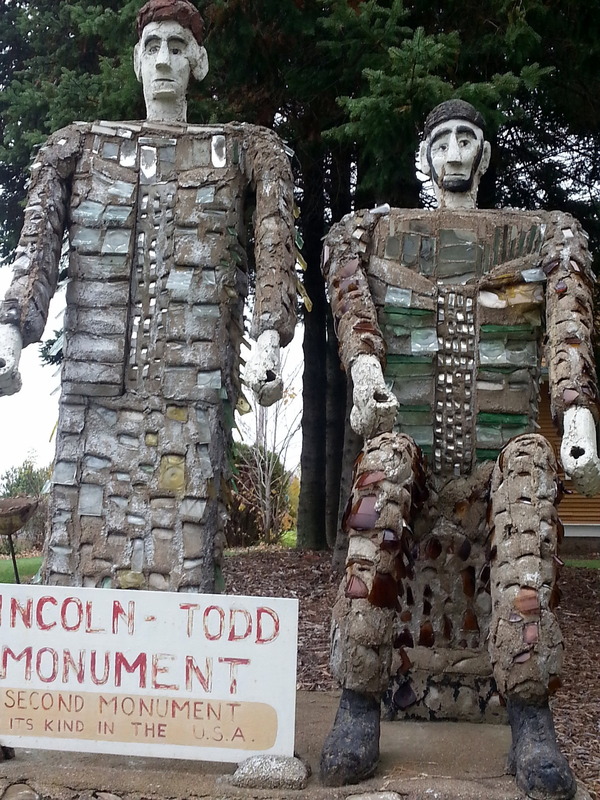 It’s a sculpture park, all works by Fred Smith, who lived and worked in the area until his death at the age of 89 in 1976. The Park is now part of the Price County Park system, and includes the Smith family home. It’s a curious spot, well worth a visit. 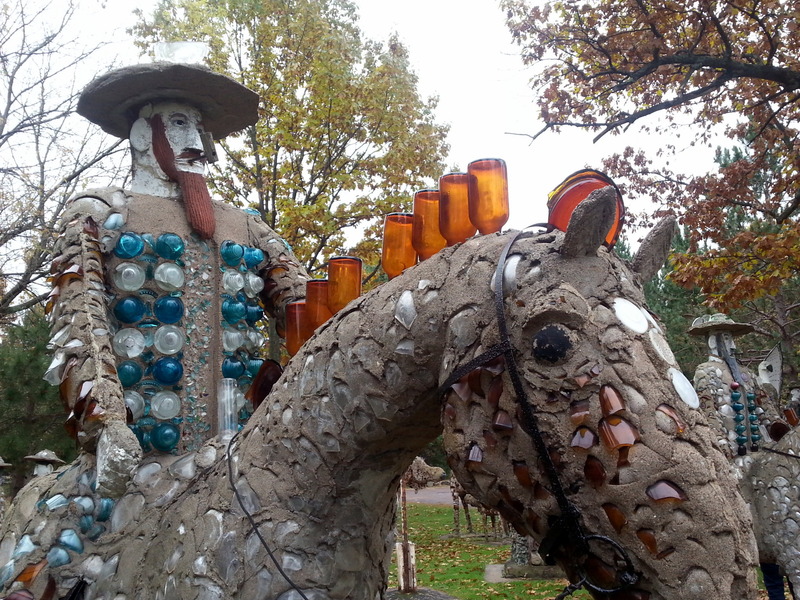 The sculptures are concrete, inlaid with pieces of glass, which seem to be primarily from colored bottles. 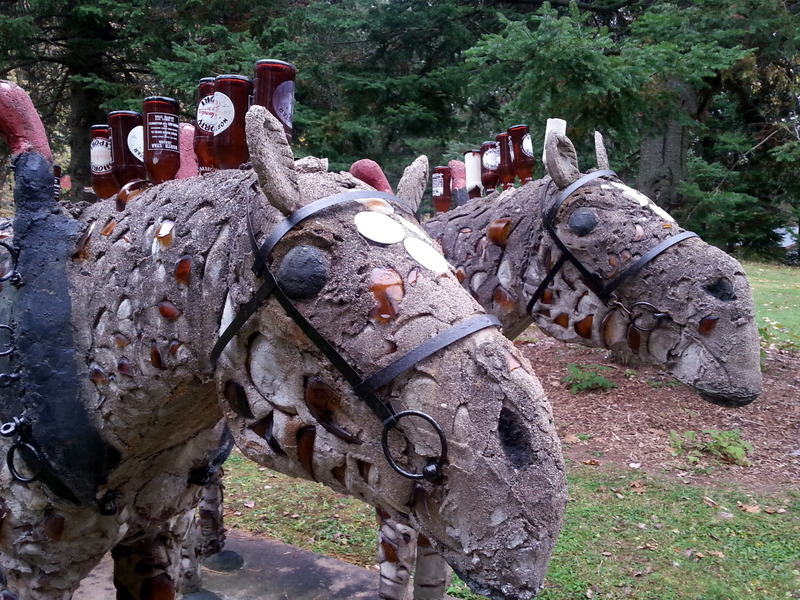 Apparently, he used real horse skulls in some of the horse sculptures to ensure that he had the heads shaped correctly. This one was called Double Wedding. This one was Sun Yet Sen, a “China Woman”. Not sure what’s with the mustache. 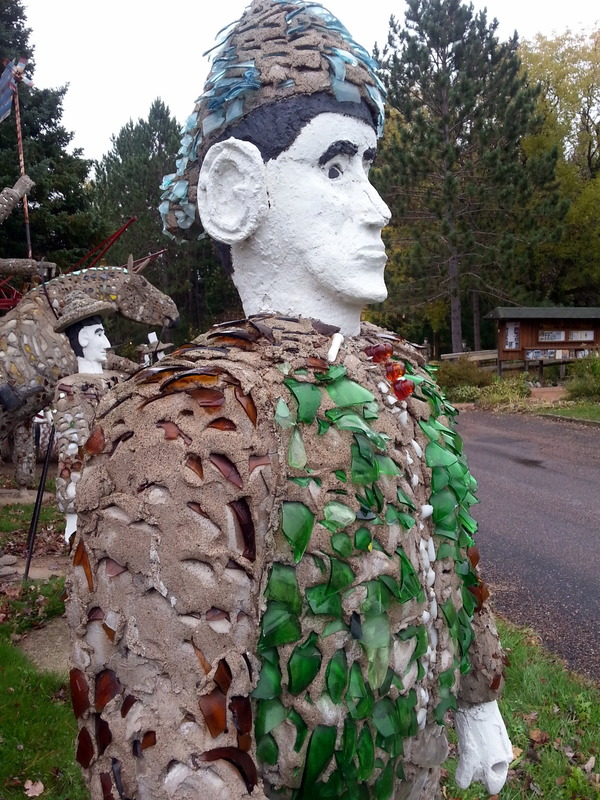 Many of the sculptures are still in need of repairs to replace fallen-out pieces of glass. Others have been restored. 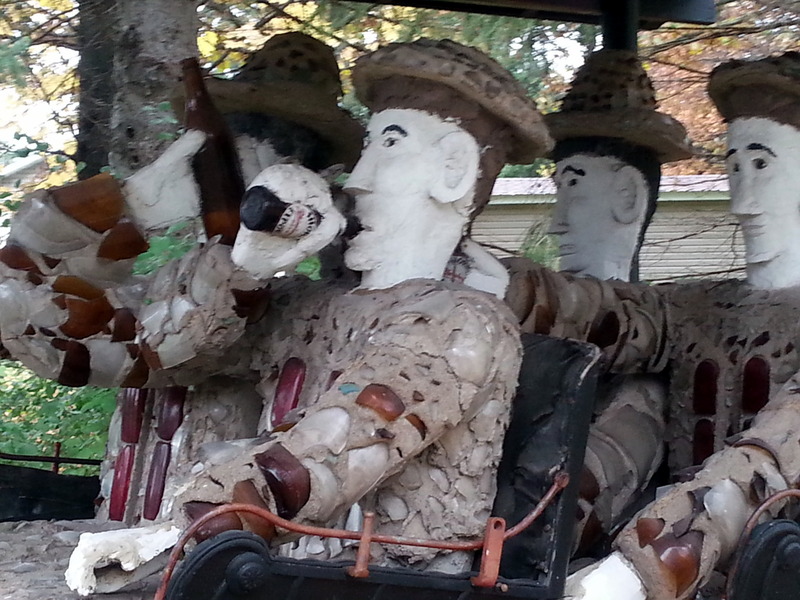 This one was my favorite because of the old Standard Oil Red Crown on the driver’s head. My dad was a Standard Oil agent for many years, and we had a Red Crown (from the top of the old gas pumps) in our garage for years. Moving on, we steam toward Governor Thompson State Park. Along the way, we notice a variety of fir tree which is bright yellow. They are gorgeous. But, after a bit of internet searching, it seems as though these trees may be on death’s door, as the result of some type of mite. In any case, we saw hundreds of them along the road. I hope they are just some variety of ‘evergreen’ which isn’t, but I fear they are doomed. As the miles pass, we reflect that we’ve stayed in lots of pretty cushy campsites lately, and have gotten away from the National and State Forest campgrounds we love. So, as we pass a sign pointing to a National Forest Campground, we make a snap decision to change plans. And so, we find ourselves camped at Richardson Lake Campground in the Nicolet National Forest, near Wabeno, WI. Great decision! We pull into an empty campground, having our choice of 27 spectacular sites. We drive twice around, and finally pick site #1. All the sites are HUGE, well wooded. The pit toilets are pristine – it looks like no one has camped here for quite some time. 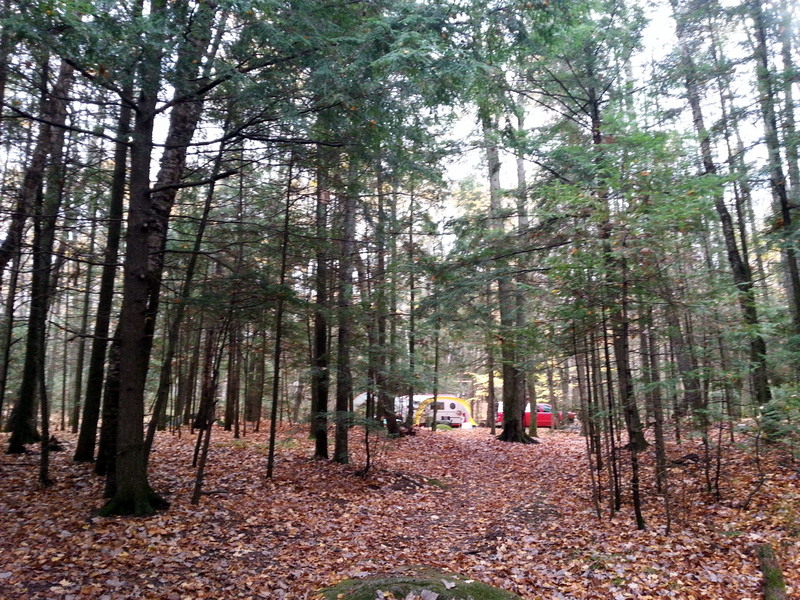 There are some yellow leaves on the treetops, but the paths into each campsite have not been driven into. We quickly established camp before the rain began. It rained for 14 hours straight, quit for about six, and has been raining every since. Oh well…..we set up our Thermarest awning (attaches right to the Fireball) and also another awning over the picnic table for some cooking space. We created a Dutch oven dinner of short ribs braised in red wine with carrots, butternut squash, and dried shiitake mushrooms. Enough for two days. Yum! 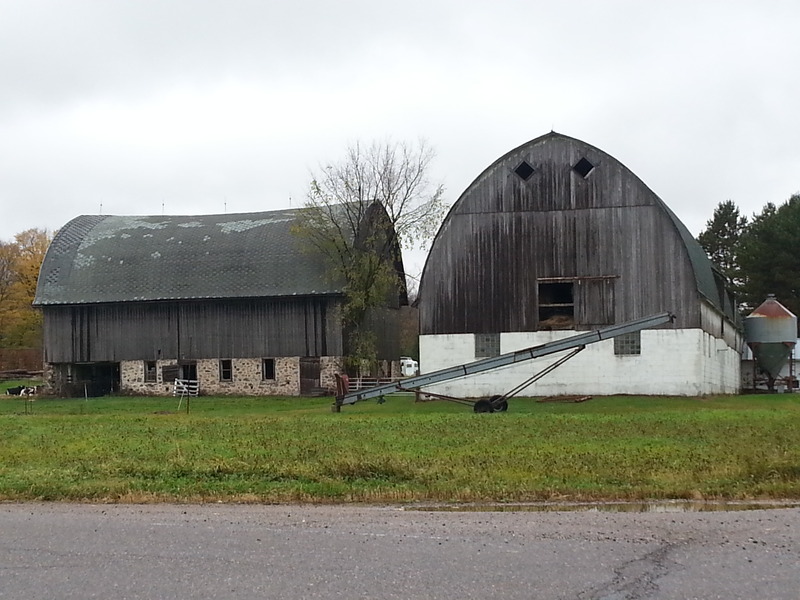 During the lull in the storm, Jezzy and I strolled around, hiking out to the highway where we saw these two amazing barns on a nearby farm. They were enormous. Tomorrow will take us back into Michigan, as we begin to wind down our northern adventure. No hurry, but we gotta get home one of these days…. 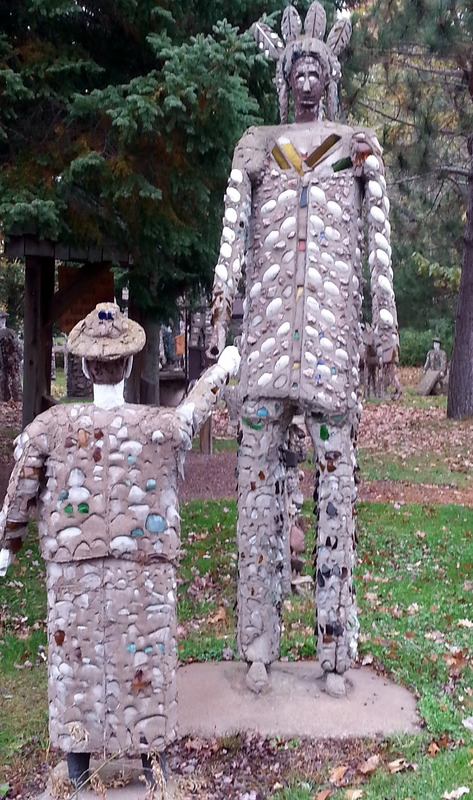 This entry was posted in camping, food, great outdoors, grilling, retirement, road trip, RV life, simple camping, state parks, T@DA, Wisconsin and tagged camping, Dutch oven cooking, National Forest Campground, retirement, road trip, RV life, simple camping, T@DA, the great outdoors, Wisconsin by Judy Crankshaw. Bookmark the permalink. Glad you found a wonderful spot for some real camping, but sad you got so much rain. I saw the national doppler weather map yesterday and thought of you. It was an interesting stop. What John couldn’t get over was that all the horses had flat butts. Like they had been created on end, then tipped up. It was hard to get any good shots – everything was pretty close together. The rain needs to go away. As I write this, it’s Day 4 in a row. We’re camped right on Lake Michigan, in the far western corner of the UP right now. The water and sky are both the same gray color. No horizon at all! Funny how a day of decent weather can erase all the really crappy days. But, I gratefully accept any warm wishes and cyberhugs. Thanks, Sgpharon. You’ve got Bob and me thinking we need to try some Dutch oven cooking…..
We actually have two or three Dutch ovens. Two with us. We have the traditional, very well seasoned cast iron, and also an aluminum one. John baked bread yesterday (the LaBrea kind). Nice to have hot bread with leftovers. The bad thing? It’s more stuff to haul. But, we use ours a lot, so…we also carry a cast iron griddle on which we make toast, or tortillas. We spend way too much time thinking about, and cooking meals! Thanks for the tip. 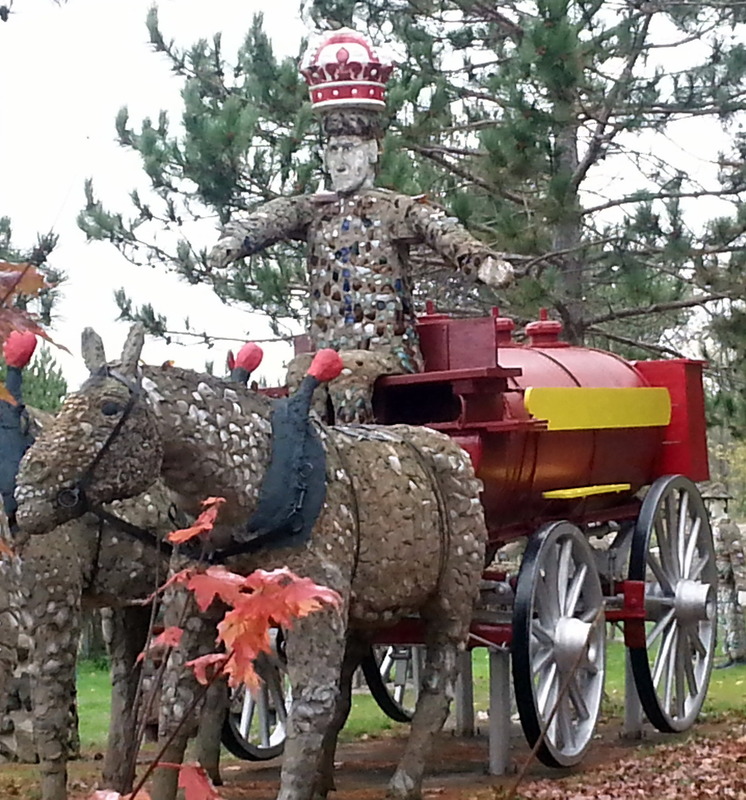 I saw that The Kohler Foundation had purchased the art to start, and donated it to the county. Good for everyone that way. Don’t know what our route is going to be, but I’ll keep your suggestions handy. Thanks, Ken. 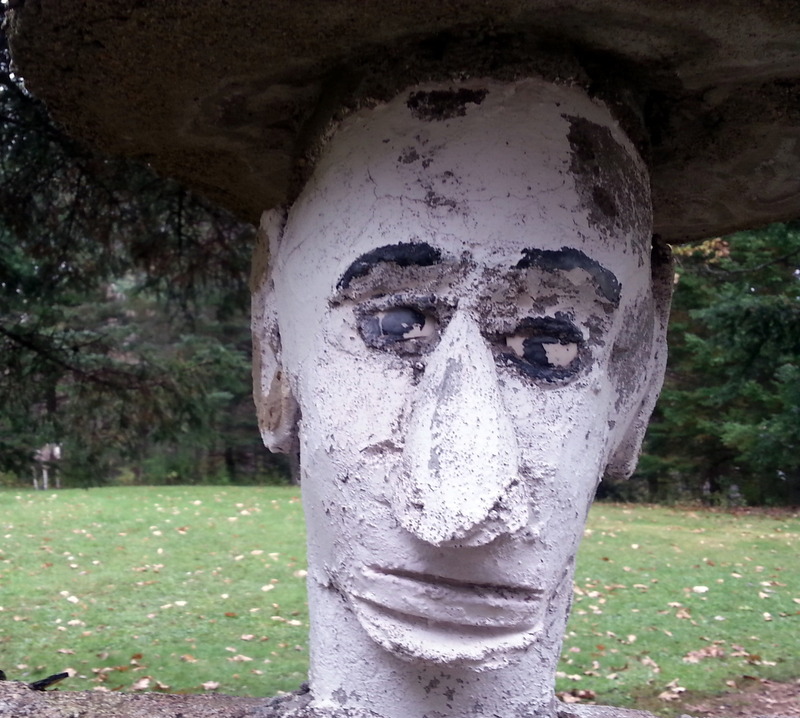 That was some weird folk art, the concrete sculptures are interesting, but not my cup of tea. Some of the “fir” trees look to be larch (AKA tamarack), the only needle leaved tree that turns color and drops its needles in the fall. 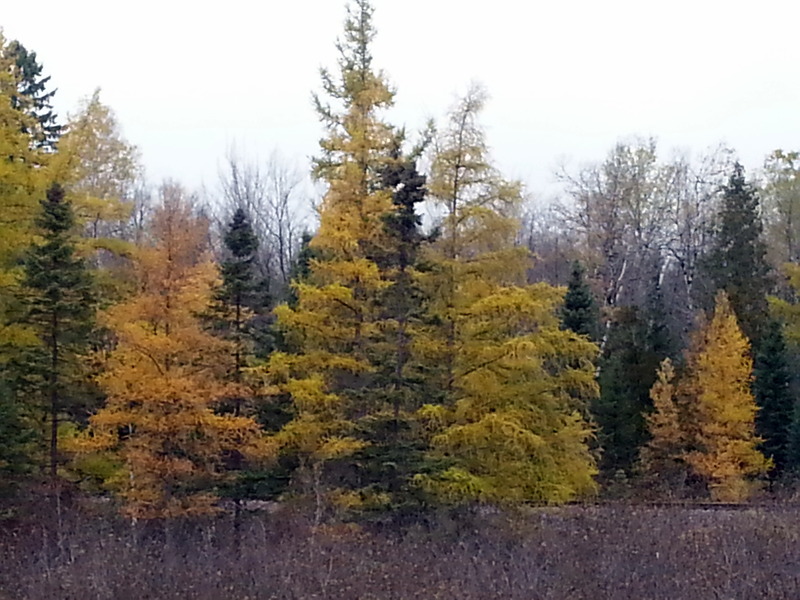 They turn a golden yellow and look similar to fir trees. No need to hurry home, it’s been raining on and off for days, and it’s forecast to continue into the weekend. Thanks for the larch info. I feel better about that now. I did very limited searching while we were rolling down the road. Radar looks like the big green patch might be following us for awhile. Wet camping just isn’t as much fun, as you well know. Those are some wild concrete structures. I’m very curious about the guy who made those and what his motivation was. It’s not my style, but it intrigues me. You’re in Wisconsin dairy land. Bet those barn had room for lots of cows and hay bales. Your meals always sound like something from a gourmet restaurant instead of camp cooking. I should hire you to cook for me. I’m afraid you’re going to be following the rain into Michigan. We’re getting quite a bit of it here, though not so constant. Hope that tree mite doesn’t move here. Those dying trees make me sad. Enjoy your remaining travel days. 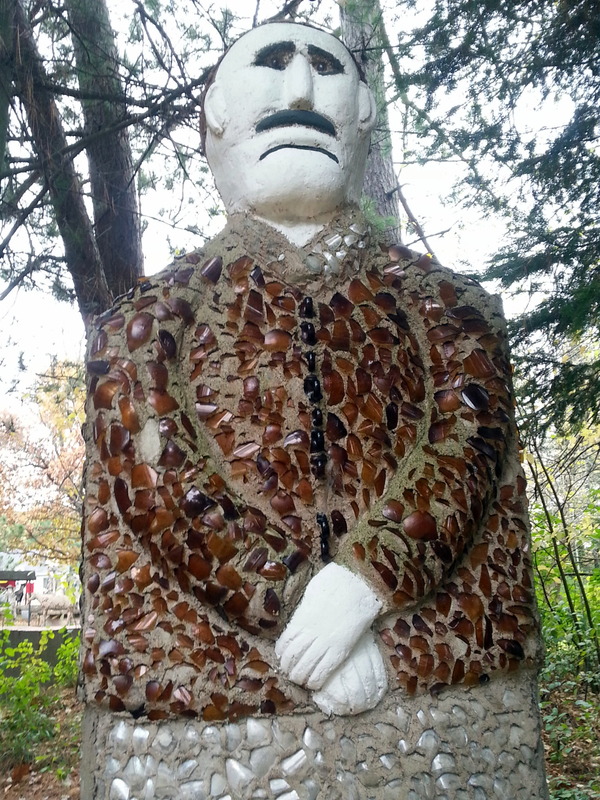 Fred Smith had been called The Picasso of the Pines by the Chicago Tribune. 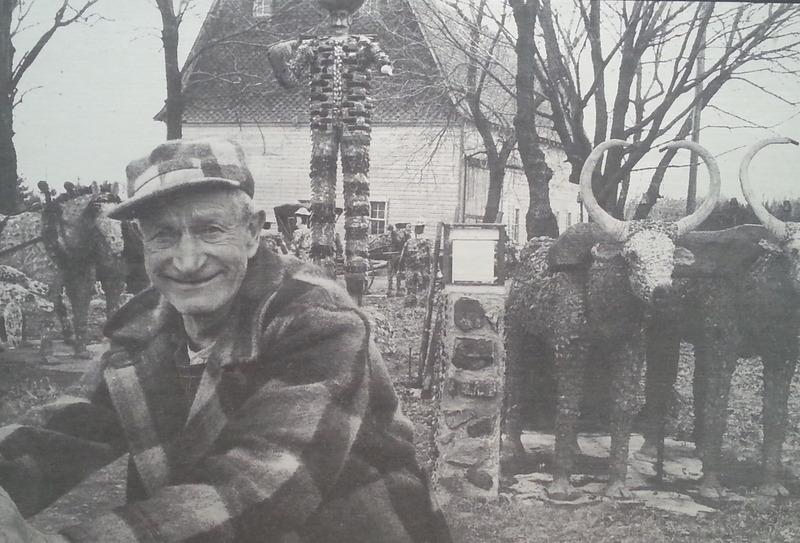 Sculpture was his retirement hobby. I didn’t pay much attention to all the info on him there, but I’ll bet Google is full of references. Try Wisconsin Concrete Park. After a day or rain, I’m ready to throw in the towel. It takes so long to dry everything out. We do eat well. No spooning beans right out of the can for us (well, not usually, anyway). Maybe I’m wrong about the trees. My limited search while John was driving didn’t come up with any variety that changes color in a healthy way. I guess it was our turn for a day or two or rain. But, it sure makes things messy in camp! Thanks, Ingrid.